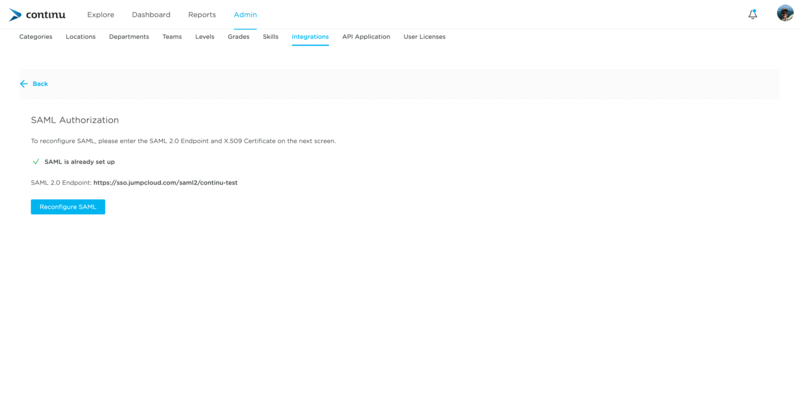 Step 1: Start by navigating to the JumpCloud administrator console and select Applications. Step 2: Click the Plus icon at the top left of the page and search for “SAML”. 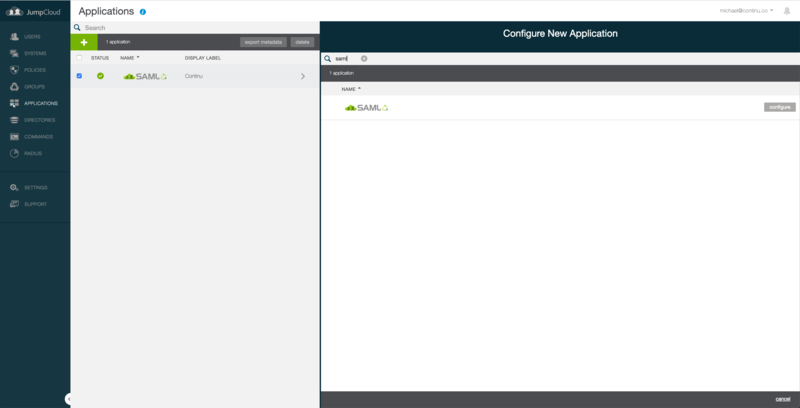 Step 3: Select configure on the “SAML” option. Step 4: In the IDP Entity ID field, enter a unique name to help identify the application. We suggest using "Continu". Step 5: Generate and upload the IDP Private Key and Certificate Pair. 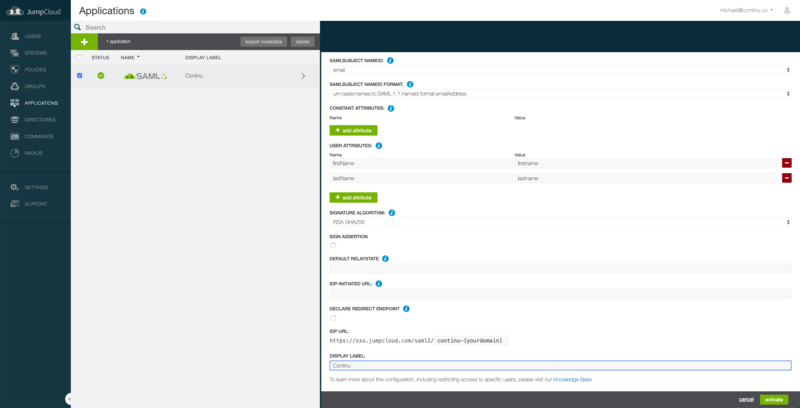 For more information, please see JumpCloud SAML Configuration Notes. *replacing [your domain] with the subdomain of your Continu instance. Step 7: Copy and paste the same value from Step 6 in the ACS URL field. Step 8: In the SAML Subject NameID field, enter email. Step 10: Underneath USER ATTRIBUTES, select the Add Attribute button. Step 12: Click Add Attribute once more and type lastName for the name and lastname for the value paying very close attention to the letter casing. Step 14: Click the green Create button. Step 17: Navigate back to your Continu instance, go to Admin > Settings > Integrations. 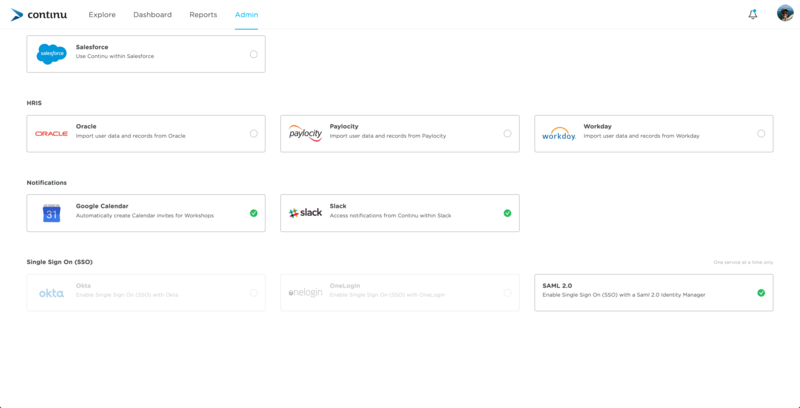 Select SAML 2.0 from the integration list. 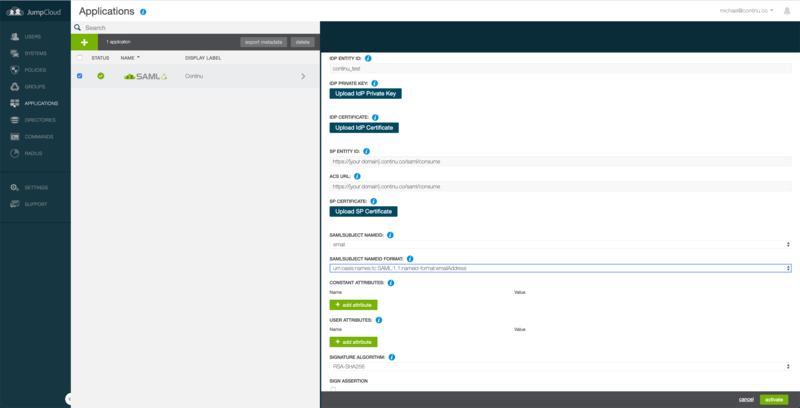 Step 18: Under SAML 2.0 Endpoint, paste the full URL you created in Step 13. Step 19: Under X.509 Certificate, paste the formatted certificate from Step 16. 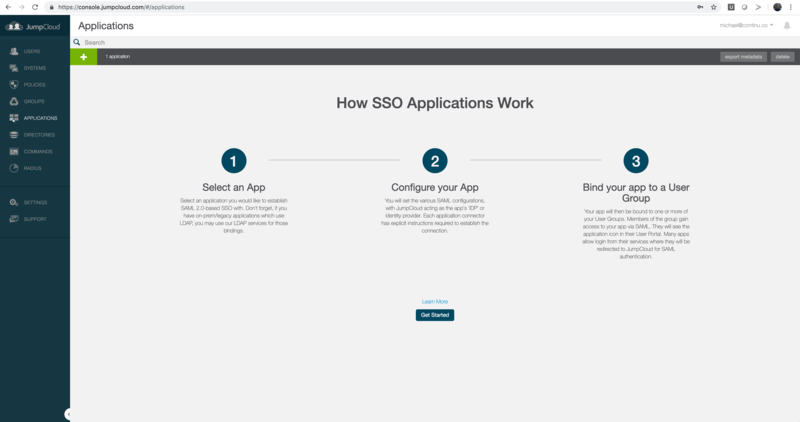 Step 20: Click Submit and the SAML Integration is now complete! All you need to do is give your users permission to access the Continu application from JumpCloud.